There is some data that needs to be explained. The Period line shows the period for which was generated the report. Its length, that specified in the brackets, will be considered as 100%. All percents specified in the table are the parts of this value. 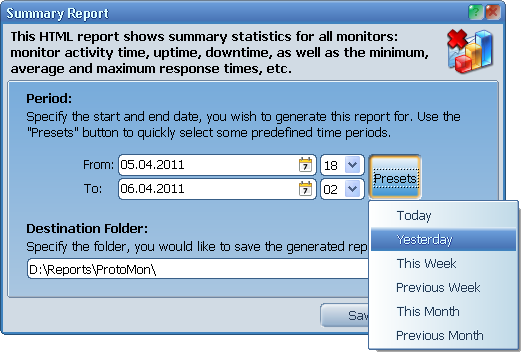 The Active column shows the time within selected period when ProtoMon was running and the server monitoring was enabled. The Uptime and Downtime columns are self-explaining. The Config Errors column displays the time when monitor checks was failing because you configured this monitor incorrectly. 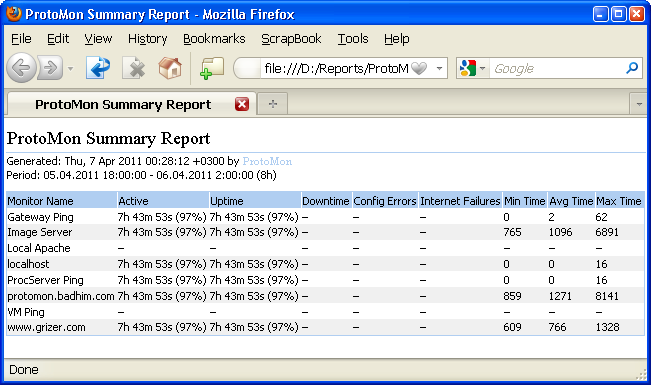 The Internet Failures column shows the time when ProtoMon was unable to monitor the server's status because the Internet connection wasn't available. The last three columns Min Time, Avg Time, and Max Time, show the minimum, average, and maximum response times for the corresponding monitor.